Well for the instance part, not removing them from the list, i rather have them shown in Green name so that you know ok that one is done, and if they are white you know you still miss stuff in there. Could you explain better what do you mean by that? Exactly what I was missing. 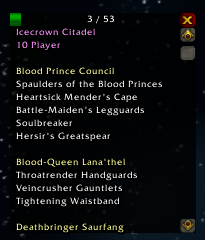 Is it possible for the addon to automatically check if your in an instance... and if so then show that one as default when you open it ? And if your not in a instance then it just show the list ? And thx a lot for making this great addon !!! 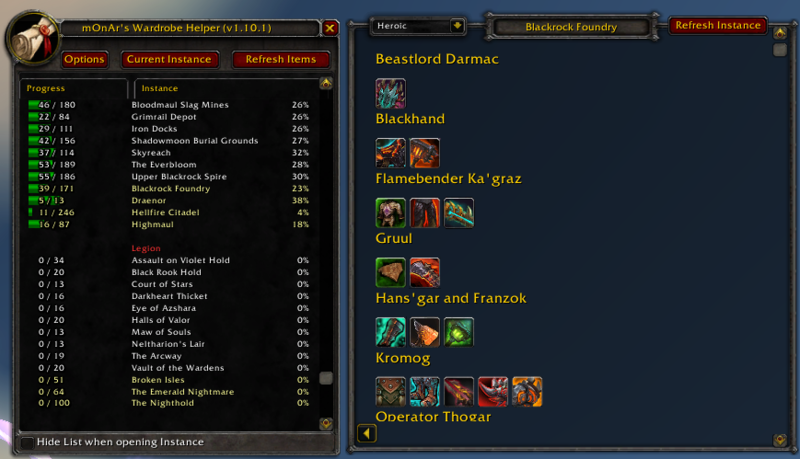 Reporting Firelands being missing on mine, and I checked on multiple characters (I know for a fact I am still missing some of the ranged weapons, for example). The list will go on and on, just on my Paladin. My other 10 100s also have pages full of missing Firelands mog. edit: I do want to say that this mod is amazing, and exactly what I was looking for. Keep up the great work, hopefully we can get some of the bugs sorted! So far it shows fine on all my characters so I'll need more help with solving it. Or actually shows some data. Can you explain me what does it mean "max|total missing"? total missing - all leather for me from dungeon or all cloth/plate etc for my account? I assume that's impossible to understand number, unless you read the source code.